What is a Solar Group Buy? Solar is no longer future technology: it’s being deployed on a massive scale today. More solar-friendly policies and continuous decreases in price make solar a better and better investment. But most people need more information about solar, and need a way to learn about the technology and its potential to lower their energy bills. The purpose of a group buy program (also known as a Solarize program) is to increase education of local residents about solar photovoltaics (PV), and increase market penetration of residential and small commercial solar PV through a group purchasing program. Group Buys are important tools for increasing solar deployment in a market in a short period of time. When done correctly, they can be beneficial to everyone involved, including residents, businesses, local organizations, and jurisdictions. They work by aggregating demand for solar, usually in a small geographic area, achieving economies of scale. They lower the solar installers’ “soft costs” further by providing up-front customer education en masse, leading to a higher-than-average conversion rate for solar leads. Home and business owners see lower prices for their solar array, and communities move toward achieving their sustainability goals. A solar installer is selected through a competitive Request for Proposals process involving an advisory committee of community stakeholders. Free, public information sessions (we call them “Solar Power Hours”) are hosted throughout the community over a period of several months. Local jurisdictions, organizations, volunteers, and MREA help spread the word to the community to invite as many people as possible to learn about and potentially invest in solar. As more people decide to go solar, the price comes down for everyone. Participants have a deadline to make a solar “go” or “no-go” decision. After that, the group buy pricing goes away. Solar installations happen throughout the program timeline. 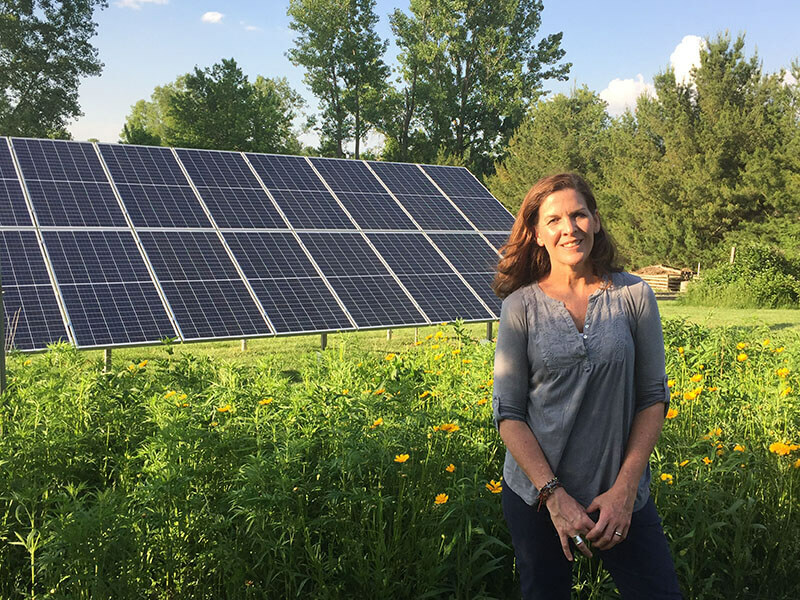 Sheila Voss went solar through a Group Buy and became a Solar Power Hour presenter in Solarize Metro East. MREA is proud to present the following Group Buy programs in partnership with trusted local jurisdictions and organizations. 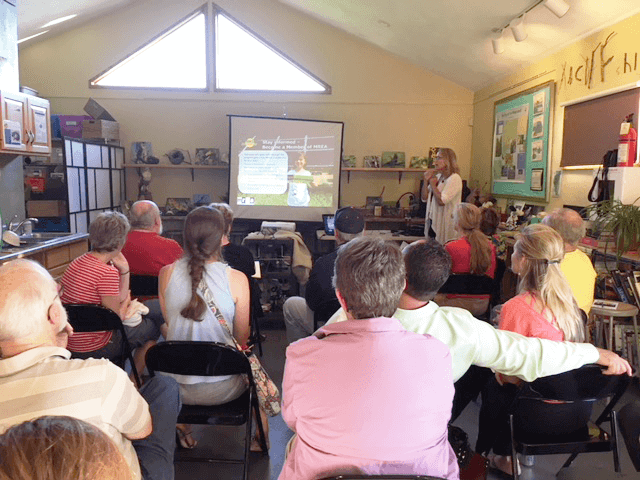 Virginia Woulfe-Beile, one of MREA's Solar Power Hour presenters, educating potential group buy participants at Watershed Nature Center in Edwardsville, IL. In a solar group buy, people learn about solar together with neighbors, local business owners, and community leaders. Working in partnership, we provide high value education that informs people about the technology and the investment potential. Solar is contagious: a short burst of market activity can lead to an increase in solar deployment for years to come. And, because the more people who go solar, the lower the price for everyone, Solar Group Buys inspire many people to go solar who otherwise wouldn’t. 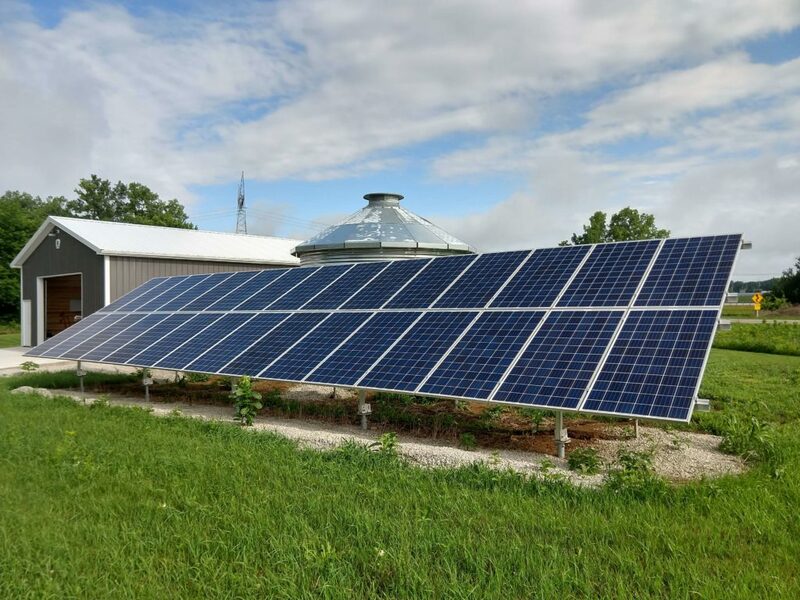 Property owners get access to lower prices for high quality solar arrays that save them money on their electric bill for decades and increase their energy independence. Communities reach their climate goals faster through the education and investment of their residents in solar photovoltaics. Emissions from hundreds of thousands of pounds of fossil fuels are avoided thanks to dozens of property owners producing their own clean electricity. For a more detailed overview of the group buy program design, timelines, and roles, download the Group Buy Overview. Said it was important that the group buy program is managed by an independent nonprofit. Said they are more likely to pay attention to energy policy issues in their state. Said it was important that the group buy program has the support of a municipality. 59% of respondents said they were unlikely or very unlikely to have installed solar without the group buy. Only 25% said they were likely or very likely to have gone solar without it. Said it was important that information at Solar Power Hours is developed by an independent nonprofit. Said they knew more about issues relating to solar as a result of the program. Said they found the Solar Power Hour informative or extremely informative. Said they are now more aware of solar resources and tools available to them. MREA has facilitated 22 programs, reaching over 6,300 individuals and resulting in over 7 megawatts of solar on more than 1,000 properties. Would you like to bring more solar to your community? We are now accepting applications from communities wishing to host solar group buy programs in 2019. Solar Group Buys cost nothing to the organizations and jurisdictions we partner with except for staff time. Funding for our work comes from grants and from a small administrative fee charged to the selected solar installer. Applications will be accepted on a rolling basis. The first cutoff for applications was Friday, November 16. The second cutoff for applications was Friday, December 21. MREA staff will review all applications, but please bear in mind that applications received before the published cutoff will be given priority. Our intention is to facilitate a total of 10 Solar Group Buys in 2019. Once selections are made, all applicants will be made aware of the outcome. If your application is selected, we will begin the process of developing your local group buy program, including establishing a timeline for the solar group buy in your community, formation of an advisory committee, publication of a competitive request for proposals, development of program brand identity and website, and scheduling of Solar Power Hour presentations. For more information about MREA’s solar group buys or this application please email peterm@midwestrenew.org. Please submit your application through the application form linked below. For your convenience and ease of preparation, the application guide makes all the questions available in a Word doc. For more details about program design, timelines, and partner roles, please download the Group Buy Overview. The printable one-page flyer is a brief overview for potential partners.